I’m starting a new series, if you will, where I’m going to focus on some the things you can do to make your life as a voice over actor just a little bit easier. I’m calling it “Stress Less” because the ultimate goal is reducing your stress level. Plus, Stress Less rhymes, and I like that! 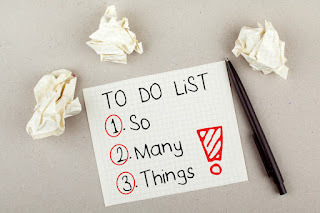 Today’s inaugural Stress Less post is about managing your to-do list. Now, I know that not everyone uses this method to keep on top of things, but I am a big list maker. I like lists because they keep me organized, on track, and every time I’m able to cross something off, I feel pretty amazing. If you’re not a list maker, well, you know what they say - no time like the present to start! Step 1 - Pick a format. Whether you use the old-fashioned pen and paper method or a task management website or app, pick one you like and keep with it. Step 2 - Add your tasks. Try breaking up bigger tasks into smaller ones that are more manageable, and be sure to include any extra info you may need to get the job done (i.e., a web link or someone’s contact info). Step 3 - Categorize tasks. As you’re inputting your tasks, be sure to organize them into specific categories. These might be things like marketing, recording, editing, or personal. Step 4 - Prioritize tasks. Some tasks are more important than others. Mark the more important jobs as “high priority” to remind yourself to focus on them first. A numbering system works great for this, where you rank tasks 1-4 depending on their priority. Step 5 - Don’t overdo it. If you write down every little thing that needs to be done, your list is going to be a mile long. Stick to the important stuff or things that you need a reminder for. You don’t need to put regular, everyday tasks such as getting the mail on there. Step 6 - Plan for the present. It may be tempting to put longer term tasks or goals on your list, but save yourself the headache of having to wait forever to cross it off. Focus on what you have today, tomorrow, later in the week, and update your list as you go. These are just a few of the strategies that I use when planning my day. I find that a to-do list works wonders for my productivity, but I have also struggled in the past with the list getting out of control. So do like me and use the steps above to help you organize your tasks, stay on top of things, and stress less!